George Rust Bedinger was the son of Henry Bedinger III (45) and Margaret Elizabeth Rust. We have anecdotal sketches of information on George Rust Bedinger. Perhaps the greatest insight into George Rust are the letters he exchanged during the Civil War with his sister Virginia (Diddy) (138) and his stepmother Caroline Bowne Bedinger. 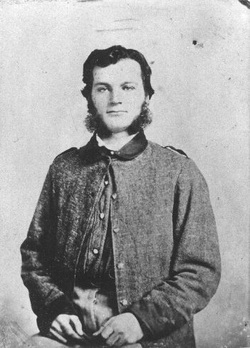 George Rust volunteered at the outbreak of the war and served to the Battle of Gettysburg. The many letters he and his sister, Virginia, wrote provide a timeline for many of the important battles of the war and information on the activities of many of his relatives and friends during the war. The first letter is posted in this page and succeeding letters are linked to each page in the series. George Rust’s mother died in 1843 leaving George, age three, and his sister Virginia (Diddie), age two. When his father Henry Bedinger III (45) was elected to congress in 1845, George Rust and his sister, ages four and three years, went to live with their grandparents General George and Maria Rust in Leesburg, Virginia. George and his sister became very close during these years as evidenced by the letters they wrote each other during the Civil War. While in congress, Henry Bedinger met and married Caroline Bowne Lawrence, the daughter of a fellow congressman, John W. Lawrence of Flushing, Long Island. After serving two terms as Congressman from Virginia, Henry Bedinger was appointed Charge d’Affaires in Denmark. Henry and Caroline had three children, Mary (Minnie) (140), Henry (141) and Caroline Dane (Danske) (142). Henry Bedinger died in 1858, shortly after his return from Denmark. His widow Caroline moved to Flushing, Long Island, New York to be near her parents and her sisters. After moving, she found that she preferred the friends and the ambiance of Shepherdstown, Virginia. Caroline and her children returned to Shepherdstown and soon afterwards she purchased “Poplar Grove”. George Rust and his sister Virginia came to live with their stepmother at "Poplar Grove". "Poplar Grove" had been the home of Elizabeth Bedinger (5), an aunt of Henry Bedinger III, and her husband Abel Morgan. In January 1861, his stepmother learned from George’s sister that he was ill and wrote him the following letter, expressing her concern for his health, promising to visit him if need be and expressing the hope that a Civil War is not inevitable. I am much concerned to hear by your letters to Diddy of your sickness and I now write to beg that if at any time during your residence at the University you should be sick enough to be confined to your bed and require nursing that you will immediately acquaint me with it that I may come to you unless serious illness here should prevent me. I can always get someone to take charge of the house and children in any absence. I sincerely hope that you are now recovered and that you will take care of yourself. We shall feel anxious until we hear from you again. Diddie has written to you so lately that I suppose she gave you all the news (if there was any). We have all been so confined with the Influenza that we might be thin desert for all the news we hear except through the public papers. All the family are now convalescent. Entire recovery is impossible while such weather continues. I think this has been the blackest dark most incompatible winter I ever remember in this county. Yesterday Diddie and I dined at Bedford where we met Colonel Thompson and Nannie Boteler. I was glad to have an opportunity to hear conversation on the State of the Country. Mr. Lee is at ____ at last ____ South Carolina. I cannot and will not yet believe that Civil War is inevitable. I think that some plan will be adopted to insure the rights of the South in the Union or if that should not be the case, that the United South will be allowed to peaceably form a separate Confederacy. This is the all absorbing topic of the thoughts and conversation. Write to us at once upon receipt of this if you have not already done so. Take care of yourself until your cold is entirely removed. God bless you and watch over you.